Home > Events, Informatics Distinguished Lectures, Logic	> Dov Gabbay: You’re a legend! Dov Gabbay: You’re a legend! 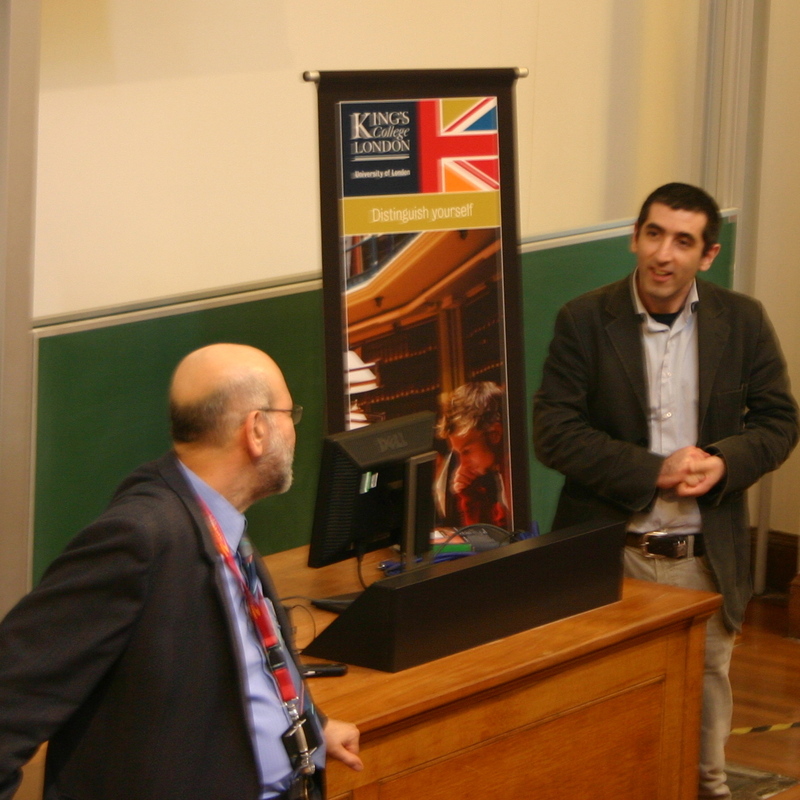 Being Head of Department sometimes has its drawbacks, but kicking off the Distinguished Lecture Series of the Department of Informatics at King’s College London on 21 June 2012, and introducing our first speaker has to be one of the highlights so far. Emeritus Professor Dov Gabbay has had a remarkable career in Computer Science, and is rightly regarded as one of the outstanding minds in the area of logic. Dov retired in 2011, but I’m delighted that he remains with us at King’s as Emeritus Professor. Indeed, there’s no sign of him slowing down – he remains as active as he ever was. As I said when I introduced his lecture, one of my prized possessions is one of Dov’s many volumes on logic in his series of handbooks. I acquired it as a PhD student way back, and have ensured that it stays on my shelf, despite being forced to downsize my book collection on several occasions. So it was an honour and a privilege to invite Dov to deliver his lecture. Of course, the lecture was outstanding, both instructive and entertaining, and set a very high bar for those who will follow in the series of Informatics Distinguished Lectures (look out for future lectures!). We’ve recorded it on video, and I’ll post a link here (as well as several other places) once it’s available. As Carlito’s nephew(?) in the film, Carlito’s Way, says to Carlito (played by Al Pacino), “You a ****ing legend, man!” I can think of no one to whom such a statement applies more than Dov. *pesters* I couldn’t make it, will there be a video of this soonish? Hi Thomas. Yep, the video is in production. We’ll post here as soon as it’s ready!